The dissolved air means mixture of air and water at a higher pressure. At higher pressures the air can get dissolved and can remain in same state till the pressure is maintained. The air gets released after the pressure is reduced. To dissolve the air, to maintain the dissolved state and to use for separation process requires separate scheme. NIRMAL have specialized process in for this purpose. Please click here to see detailed view. The treated effluent is used for dissolving air. The treated effluent is pumped by means of multistage high pressure pump into high pressure motive stream side of water jet ejector. The specially computer designed convergent nozzle forces the high pressure water into the high velocity jet which creates the relative pressure drop and so low pressure zone on the suction side. Due to low pressure on the suction side, the compressed air gets sucked and gets dissolved in the mixing zone of the water jet ejector. Since the specific gravity of the air too smaller than water, more air gets sucked. The dissolution of air will be only upto extent of saturation level. The extra air will remain undissolved. The mixture of air and water along with excess additional air enters in the pressure vessel. The mixture of air and water will have air as dissolved and so will have properties of water. This water is hence forth called as dissolved air, will move vertically downwards. The excess air will move upwards which will get sucked automatically by the water jet ejector. Thus air water ratio in the dissolved air will be maintained. In the pressure vessel due to the retention time the size of the dissolved air is homogenized and uniform size air bubbles are available for flotation. The dissolved air will be inserted in the flotation clarifier through the throttled dissolved air valves. The entry of the dissolved air will be from the bottom, so that entire portion of the flotation clarifier will be stripped by the dissolved air and fine impurities will be made to float. The throttled dissolved air valves will create the pressure drop as the flotation clarifier being open is at atmospheric pressure. The throttled dissolved air will generate billions of microscopic ultra-fine air bubbles which will adhere to the fats, oils, grease, fibres and suspended solids and make it to float upwards in the form of compact sludge. The dissolved air will rise slowly maintaining the laminar state in the flotation clarifier and will not disturb the flocculated state. Overall the dissolved air bubbles will perform following. The dissolved air bubbles act as nuclei for the attachment of entire floating matter consisting of fats, oil grease, fibres, suspended solids and part of the colloidal solids, and thus forcing the movement of the agglomerates of solids to the flotation clarifier surface. The dissolved air bubbles decreases the floc-solid + bubble density to less than that of water. More the volume of bubbles attached to the solids will make the floc-solid + bubble the lighter in the density and make the rise rate of the floc-solid + bubble floc on the higher side. It will also release dissolved gases out of water. The treated effluent will then pass through parallel plate coalescer to remove the air bubbles from outgoing effluent. Such removal will polish the waste water not only for air bubbles but also for fine impurities. This Mechanical Desludging, Hydraulic Desludging and Combined Desludging. The multistage high pressure pump capacity may not be same as actual dissolved air inserted in the clarifier. It is normal convention to use higher capacity pump so that adequate dissolved air is ready for achieving the desired results. For tuning the pump capacity and the actual dissolved air discharge, there are two methods employed. Make the multistage high pressure pump OFF after achieving the higher water level in the pressure vessel. Since the entry of the dissolved air in the pressure vessel is stopped and the discharge is occurring, the water level in the pressure vessel will be reduced upto lower most level. After achieving lower level the multistage high pressure pump will be started automatically. The disadvantage is that pressure in the pressure vessel will be reduced during OFF period of pump which will create dissolved air in the pressure vessel. The size of air bubbles also will be increased making difference in flotation and so final results. However this scheme requires simple control circuit. It could be easily employed incase the dissolved air as well as the multistage pump capacity are low and the air compressor have relatively higher capacity, so the pressure could be maintained in the pressure vessel. NIRMAL is using this method for initial 30 minutes after starting the plant as the original pressure is zero. It is also important to maintain constant pressure. 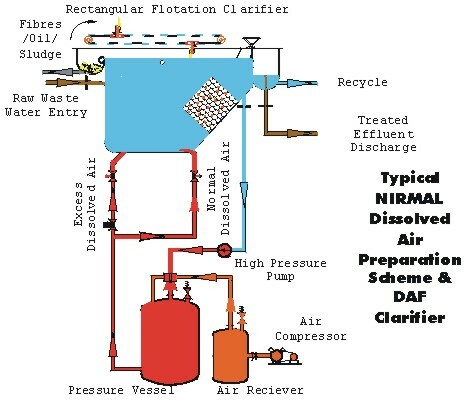 Only NIRMAL scheme uses following controls to maintain so as to pressure variation less than 0.01 kg/cm2. The level control in the pressure vessel within maximum and minimum limits created constant pressure head on the pump. Pressure drop of dissolved air in the pressure vessel to the tune of 0.1 kg/cm 2 will make the level rise by 1 meter which may reduce the free air content in the dissolved air and thus may make the water to get sucked instead of free air. 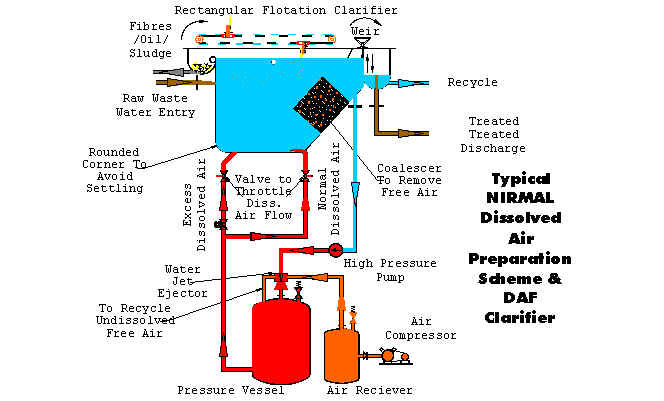 The low level in the pressure vessel may create large air bubbles in the clarifier due to excessive escape of free undissolved air. The water level control in the pressure vessel is achieved by throttling the dissolved air valves so that level variation is in control. The higher level in the pressure vessel will make pneumatic actuated control valve open and discharge the additional extra dissolved air which will reduce the level in the pressure vessel. The lower water level in the pressure vessel will make the control valve closed. The rise and fall in the level could be seen visually in level gage and optionally could be checked by the flowmeter with alarms for higher values. The throttling valves are specially designed to have protractor fixed to measure the rotation and thus correct throttling could be achieved. In addition, the pressure in the pressure vessel is maintained between lower limits and higher limits. The Higher pressure limit will make the extra pneumatic actuated control valve additionally ON or OFF during rise of the water level in the pressure vessel. Lower pressure limit will make the air entry from the air receiver ON or OFF. It will also make the extra pneumatic actuated control valve additionally OFF or ON during fall of the water level in the pressure vessel. The air entry to the water jet ejector/pressure vessel is adjusted by measuring the actual flow in the flowmeter and kept slightly above the bare minimum value. The treated effluent is filtered through fine cartridge filters so that particles upto 25 microns or less if ordered. The filtering will make the dissolved air valves less clogged and will deliver the constant dissolved air to the flotation clarifier. The control circuit will be designed to have the operations automatic with additional safety measures. Optionally alarm anunciators will indicate the measures to be taken to avoid worst conditions.